This engaging activity gets students out of their seats and thinking. 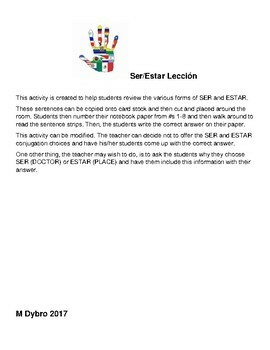 This activity helps students review the various forms of SER and ESTAR. The sentences can be copied onto card stock and then cut and placed around the room. Students number their notebook paper from 1-8 and then walk around to read the sentence strips. Next, students write the correct answer on their paper. This activity can be modified. 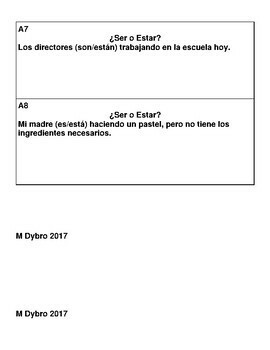 The teacher can decide not to offer the SER and ESTAR conjugation choices and have his/her students come up with the correct answer.